we begin a race against time to enjoy our treats before they melt. already testing the water. The boys dive under quickly. a mound, which strongly resembles an overturned pail of wet sand. those few we will take home. but before we are allowed inside Dad must rinse us clean. I scramble with my brothers to be first in line for the hose. and ice cream and hours of play in tide pools and cold waves. 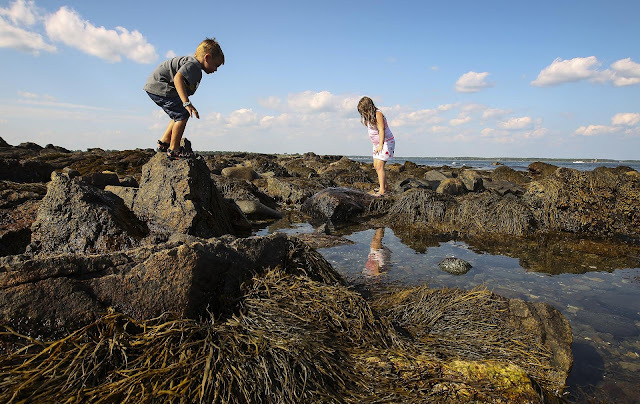 Poet's Notes: As a child, summer vacation meant a trip to New England to visit relatives and always included at least one day at the beach riding waves and exploring mud flats or tide pools. And so began my love of the ocean, which probably led to my youthful years as a competitive swimmer and my master's degree in marine zoology. At some point, my family discovered the wide beaches and warm blissful waves along the Georgia coast, but my early memories all involve the skin-numbing waters of New England.